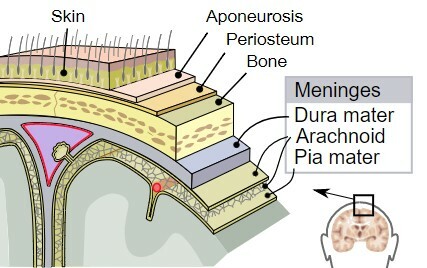 The term meningitis refers to the inflammation of the meninges, the three protective membranes covering the brain and spinal cord, especially the pia mater, a very delicate impermeable membrane, and the arachnoid matter, a loosely fitting tissue above the pia matter (the third membrane is called dura mater). The disease ‘may be either a relatively mild illness caused by a virus (as the Coxsackie virus) or a more severe life-threatening illness caused by a bacterium (as the meningococcus)’ (MWC). The word meningitis, pronounced [ˌmɛn.ɪn.ˈʤaɪ̯.ɾɪs] in English and [me.niŋ.ˈxi.t̪is] in Spanish, was coined in 1825 for this disease by adding the Medical Latin suffix ‑itis ‘inflammation’ and the stem of the plural word meninges, which was borrowed in the early 17th century from New Latin meninges, probably from Middle French. 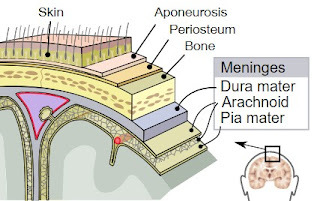 The word meninges was the plural of New Latin meninx, which is an adaptation of Greek μῆνιγξ (meninx) ‘skin, membrane’ (it could also mean ‘lees of wine’). The singular word meninx has also been borrowed into English with the meaning ‘a membrane, especially one of the three membranes enclosing the brain and spinal cord in vertebrates’ (AHD). In Spanish, the singular of this word has been regularized to meninge. There are many types of meningitis since the inflammation of the meninges may be caused by several infectious agents, mostly by viruses (80%), but also by bacteria (15+%), fungi, protozoa, and even some medical drugs. The disease is more common in children and people with compromised immunological systems. In 2015, there were some 8.7 million cases of meningitis worldwide, resulting in about 379,000 deaths (WP). It is most common in an area of sub-Saharan Africa known as the meningitis belt. Meningitis can be life-threatening due to its proximity to the brain and the spinal cord and, even if not fatal, it can result long term disabilities such as such as deafness, epilepsy, and cognitive deficits, especially if not treated quickly (WP). Epidemic meningitis seems to be a relatively recent phenomenon, with the first known large outbreak happening in Geneva in 1805, with some major epidemics occurring first in sub-Saharan Africa in the early 20th century. A particular bacterium known as meningococcus or Neisseria meningitidis is the cause of some forms of meningitis known as meningococcal meningitis or meningococcal disease, the kind more prevalent in African epidemics. An infection of this bacteria may start with a rash in different parts of the body and the infection then may or may not extend to the meninges. Since the end of the 20th century there is a vaccine against this bacterium.